MKM Medium Rollers for Clay (For use with Handle 1) : Shown right : large roller on handle. 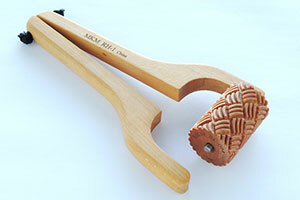 There are MKM Large Rollers for Clay (For use with Handle 1). These are great tools for quickly and easily adding texture to moist clay. They are wonderful for slab building. Mix and match the various MKM texture rollers and stamps to create your own own unique designs!